Arne Altmann, born and raised in Amsterdam, already knew from a very young age that he wanted to go in the hospitality business. After a high school period that allowed him to closely inspect all disco halls and clubs in Amsterdam, he studied Hotel Management. 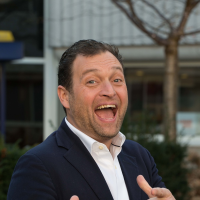 Arne worked in several hotels, restaurants and QSR chains, amongst other forming part of the team that opened the 1st New York Pizza in the Netherlands and soon became the manager in one of the trendiest restaurants in Amsterdam “De Ondeugd”. After this starting a restaurant of his own was the logical next step. Whilst preparing his business plan, he took up a position as a concierge of the Dylan hotel (fka Blakes), one of the first design hotels in Amsterdam, to remain in close contact with its potential international clientele. In December 2002 Altmann Restaurant & Bar was a fact. A monumental building at the Amstel river. Valet parking, linen table cloth, international eclectic cuisine and all that with exceptional personal service was the motto. For eight years he and his team served a clientele from over the world with full attention to detail and his warm personal style in such a way that to date people still remember. With an ambition to build a more scalable business, he sold Altmann Restaurant & Bar, and pitched for and obtained the Master Franchise Agreement for Le Pain Quotidien Netherlands. Since then he opened eight Le Pain Quotidien’s in the greater Amsterdam metropolitan area. As a franchisee he contributed to the international organization by developing international training materials emphasizing the LPQ hospitality DNA. Co-creating the Blueprint of the Le Pain Quotidien organization with the desired guest experience as the starting point. As one of the Co-founders of Le Pain Quotidien Netherlands he is responsible for scouting the right locations, store roll-out, human resources and general management. Arne is an energetic, enthusiast hospitality entrepreneur who knows his way around in the restaurant business from supporting the dishwashers to talking to fellow industry to CEO” s, landlords and everything in between. Bust most of all, he is a passionate entertainer and host for those who are most important in our industry, OUR CLIENTS.